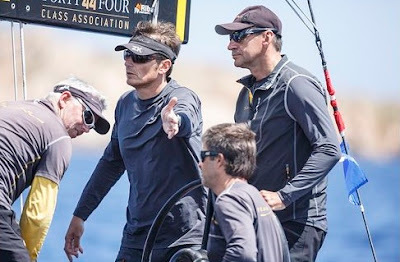 Despite the wind shifting between the north, northwest and back and varying between 6 and 12 knots, PRO Peter Reggio roared through the full schedule, completing six flights. At the close of play, today's winners were Bronenosec Sailing Team and Artemis Racing, both with four wins and one loss. However in the 2015 RC44 Match Racing Championship, that rolls from event to event, it is now the St Petersburg team that is a nose in front, on eight wins, albeit with Artemis Racing and Peninsula Petroleum close behind, each on seven. 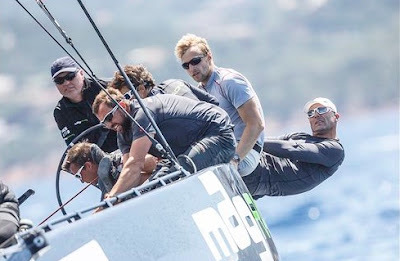 "We sailed well, we had good speed, so it felt good all through. We just carried on from the last event with good crew work, calm, making the right tactical decisions. 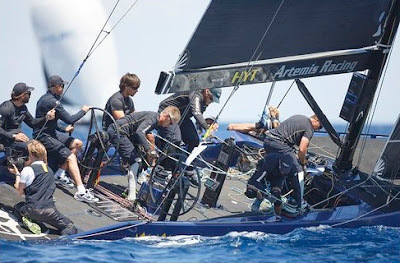 Nothing to complain about," Artemis Racing's skipper Torbjörn Törnqvist said. However for some it didn't go to plan. 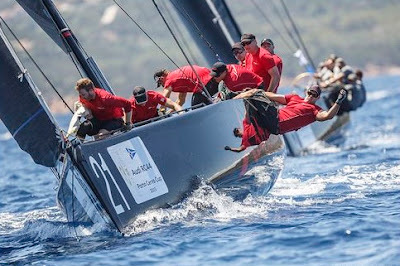 In flight four Igor Lah and Team CEEREF fell to the hand of their old tactician, Michele Ivaldi, on board Bronenosec Sailing Team. Ivaldi, via helmsman Vladimir Liubomirov, managed to plant two pre-start penalties on the Slovenian team and then, after tying them up, comfortably led off the start line never to look back. One of the most improved teams was MAG Racing on which Croatian match racer Tomislav Basic was sailing for the first time, calling tactics for skipper Artur Kasner, who said of his new recruit: "We rely on his skills and are eager to find out what he will bring to the team. I think he will be a great input." 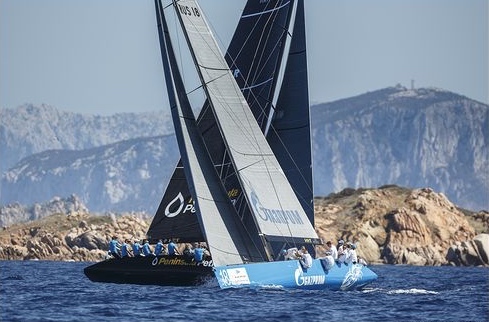 Clearly Basic is making an impression, for after winning no matches at the first RC44 regatta of the season in Malta two months ago, the Poles today won three. This included probably the most aggressive match of day against Team Nika. "We couldn't cross in front of them at the downwind gate. What I had to do was to go around them and push them into the wind, but instead I pushed into their stern." It's wasn't hard, but the whole mood then went down. 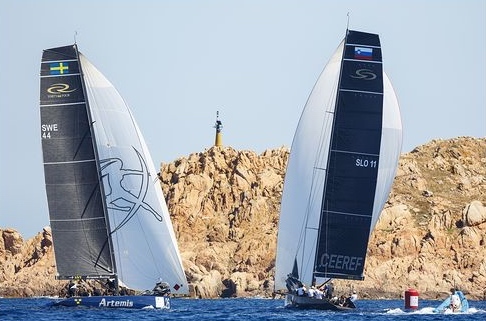 It was very unfortunate and we got a penalty," Team Nika skipper Vladimir Prosikhin said afterwards. In fact Team Nika was awarded two penalty points for the incident, causing her to plummet down the RC44 Match Racing Championship leaderboard. While there was damage to MAG Racing's transom and Team Nika's sacrificial bow broke off (as it is supposed to at such moments) both boats will be back on the water tomorrow, but the downward spiral for the Russian team did not end there. "We were trying to change the bow – and it took so long that we were late for the next start and we got a penalty for that, so our next race was bad too," admitted Prosikhin, who once ashore apologised to the MAG Racing crew.